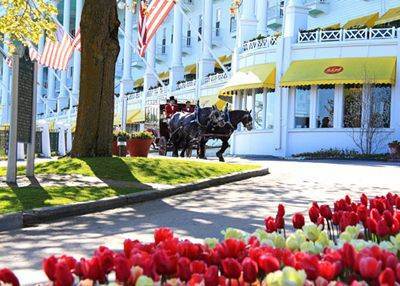 This majestic, historic place--The Grand Hotel has been a draw to Mackinac Island since it was built in 1886. W. Stewart Woodfill was hired in 1917 as a desk clerk and later become the owner. The majestic Grand Hotel is one of the first sights to visitors as they head into the harbor on one of the ferry boats: the Hotel, perched on the bluff, overlooks Lake Huron. In 1947, "This Time for Keeps" was shot on Mackinac Island with Jimmy Durante and Esther Williams and the kidney shaped pool at The Grand Hotel still used today was constructed for the famous swimming scene. In 1979, "Somewhere in Time" starring Christopher Reeve and Jane Seymour was filmed on Mackinac Island with The Grand Hotel having a starring role in the movie. In 1951, R. D. Musser joined his uncle Stewart Woodfill at The Grand Hotel and became the owner in 1979. Over the years, The Grand Hotel continues to undergo renovations and remodeling each year with newly designed rooms, air conditioning, new shops, and more. Today, The Grand Hotel, an icon of American hotels, is open May-October. The Grand Hotel is certified as a Green Lodging Michigan Leader by the Michigan Department of Energy, Labor & Economic Growth. This National Historic Landmark has 365 rooms and its famous front porch--the world's largest at 660 feet long. The landscaped gardens, pool, and golf course are just some of the impressive amenities at this Michigan treasure---The Grand Hotel.